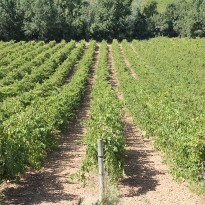 To the north of Vilafranca is the Coll de Bou estate, planted mainly with Merlot. A significant portion of the land is designated as a research laboratory, as this is where our oenologists are constantly experimenting with different varieties of vines, checking their adaptation to our climate and their qualitative yield. Thanks to this research, we have been able to plant foreign varieties such as Gewürztraminer, affording us a spectrum of aromas and flavours for the making of our wines that is much wider, as well as the possibility of offering a line of single-variety wines.